Set in the pristine polar regions of the Arctic, Jackie Morris's beautiful story reminds us that we are caretakers of these wild creatures and our actions directly affect their future. A short but poignant story that reads more like an old folk tale (and for all I know, it could be based on one), The Ice Bear is gorgeously illustrated and beautifully told. A mother bear gives birth to twins, but a raven steals one away and gives it to a human family who are without children. When the child and his bear brother meet again, it is the choice of the child that will determine the course of all their lives. I really enjoyed this story and accompanying illustrations, and think this would be ideal for both children and adults alike. 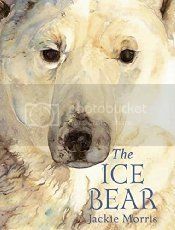 The story of the Ice Bear has a mystical element typical of the work of Jackie Morris, and the illustrations are especially beautiful and will delight both adults and children. WOW! What a great, well written story! Outstanding debut novel for Sarah Guillory. I can't wait to see what she comes out with next. RECLAIMED will pull you in and you won't be able to put it down until you're finished. I didn't want it to end! A must read for anyone looking for an excellent book. The Welcome to Night Vale novel has a cover!